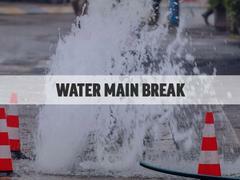 The City of Sachse Public Works crew is currently working on fixing a water main break at Salmon Street and Seventh Street. Crews have turned off the water for the following streets: Seventh Street, Salmon Street, Sixth Street, Lillie Street and Jewel Street. Thank you for your patience while crews work to fix this issue.